Disney films have surprisingly few Movie Churches. Faith is a big thing in Disney movies, but usually the films are about having faith in yourself rather than faith in God. People went to Disney comedies with the expectation of wholesomeness -- but not righteousness. In the movies, clubs are much more common than congregations. I'm pretty sure there have been many more ad executives in Disney films than clergy. 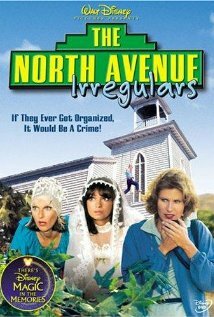 But The North Avenue Irregulars was a Disney comedy with both a Presbyterian Church and a Presbyterian pastor. Whether either would be recognized by Presbyterians in the real world as one of their own is a different matter altogether. The film begins with the Reverend Michael Hill (Edward Herrmann, rich dad from Gilmore Girls) arriving with his children at North Avenue Presbyterian Church. He's a widower because actual married couples, living mothers married to and living with living fathers are even more rare in Disney films than clergy. No one recognizes the new pastor upon his arrival, and thus zany situations ensue. (The pastor's kids ring the bell in the church tower, nearly sending a handyman on a fall to his death. As I said, zaniness.) This is rather odd, because in the Presbyterian Church the congregation votes for the pastor after he preaches a candidating sermon. They would know who this guy is. This could possibly happen in a church where the pastor is assigned, like say, the Methodists, but seems highly unlikely with Presbyterians. On the other hand, the Rev. Hill seems to have no idea about the church. When he arrives, the church secretary hands him church reports and the membership list, and he seems quite surprised by the low attendance. Again, in the Presbyterian Church, the pastor would have visited the church and learned about it before agreeing to serve there. But greater realism would result in fewer amusing double takes. The secretary of the church and the new pastor have differing philosophies on delegation. The secretary and her father (the late former pastor of the church) used to do all the work in the church because then it was done right. Pastor Hill says he's given it some thought, and he believes sharing responsibility will cause the church to grow. So he randomly asks a woman, whose name he doesn't even seem to know, to be in charge of the sinking fund (meant to help with future capital expenses). I'm all for getting people involved in ministry, but it helps to learn their gifts and abilities before entrusting them with responsibility. Because he is more interested in the gambled sinking fund money than in teaching the word of God, Hill does a one minute sermon on "Japheth the soldier was a man of mighty valor" so he can rush out to see the bookie who took the bet. Maybe this is for the best, because I kind of doubt there was much interesting content in further exposition of that text. The Reverend Hill's unsuccessful attempt to get money back from the bookie leads to the main plot and, quite amazingly, the true part of the story. The movie is based the Reverend Albert Fay Hill's true account of his fight against organized crime. The real life Rev. Hill was approached by U.S. Treasury agents to organize a citizens' task force while he pastored the North Avenue Presbyterian Church in New Rochelle, New York. He approached men in the congregation to help, but since they weren't interested, the women in the congregation took on the job. Women from his church made bets with bookies and followed money runners; that information was used to by the Treasury to prosecute cases. In real life, Hill's efforts were widely admired, winning positive national attention. In the film, the Reverend's efforts nearly get the church's charter dissolved. 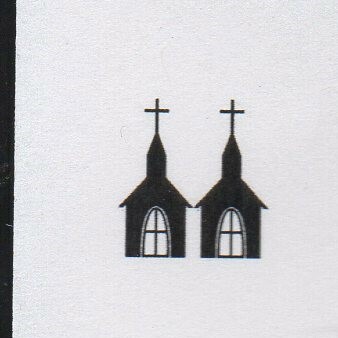 (The process for closing a church in the film seems to be quite simple. "The council" which meets in the "head office" somewhere votes to close the church. Then, during a sermon, the pastor announces, "this will be the last service of the North Avenue Presbyterian Church.") Don't worry, though: (SPOILER!) the church is saved. Which is just as well, because in this town the police are slacking, and someone has to do the crime fighting. As Rev. Hill says, "If the church is not a moral force in the community, then it's just another building with stained glass windows and a steeple." Which is why, in spite of the incredibly theologically shallow offerings of Strawberry Shortcake in the morning service, we're still giving North Ave. Pres. 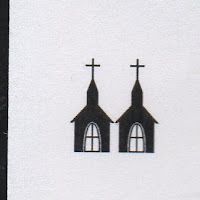 Two Steeples.